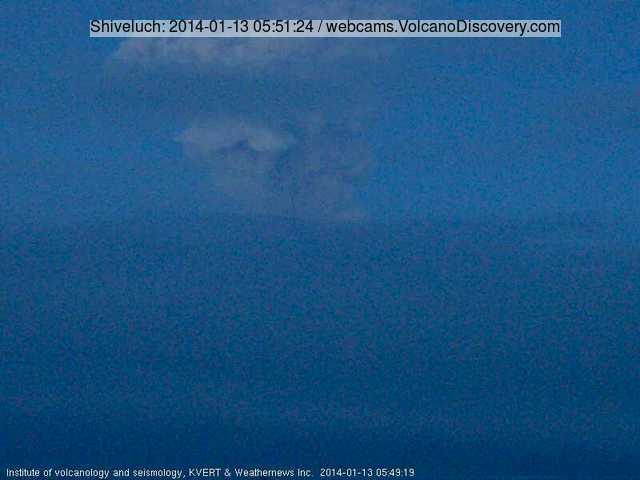 Shiveluch (Kamchatka): The volcano continues to erupt viscous lava and has frequent small to medium-sized explosions. This morning, it produced again an ash plume that rose to estimated 27,000 ft (8.1 km) altitude that drifted WSW, Tokyo VAAC alerted the aviation community. Sinabung (Sumatra, Indonesia): The number of refugees to this day is as much as 25,810, from a total of 8,040 households, in 38 refugee camps. The lava dome seems to have decreased its activity, as no more significant pyroclastic flows occurred over the past 1-2 days. However, seismic activity remains high and it is too early to predict a near end of the eruption. It could even be a precursor to more violent explosive activity if the apparent calm at the moment is simply due to the fact that the degassing / effusion process in the past weeks has become inhibited by a plug of more viscous lava under which pressure is building up. Another major hazard, especially with the likely heavy rains in the coming weeks, will be lahars - mud flows of remobilized loose ash. In addition to that, the up to 8-10 cm thick ash layer covering vast areas around the volcano is causing major damage and caused logistic difficulty (roads become muddy and impracticable). Dukono (Halmahera): Explosive activity - strombolian to vulcanian style - continues. VAAC Darwin spotted ash plumes rising to 10,000 ft (3 km) altitude and drifting 60 nautical miles to the NE this morning. Popocatépetl (Central Mexico): Activity at the volcano has increased a bit. The number of steam/gas/sometimes ash emissions rose to 11 (from averages of 2-3). The strongest explosions produced small ash plumes rising up to approx 1 km yesterday. CENAPRED also recorded a small volcano-tectonic earthquake of magnitude 2.3 yesterday. During some periods of the night incandescence was observed over the crater. Santa María / Santiaguito (Guatemala): The volcano's activity has remained essentially unchanged. Small explosions, intense degassing and viscous lava extrusion, especially on the NE side of the Caliente dome were reported this morning. Pacaya (Guatemala): Activity continues to decrease back to normal levels. Apart from weak activity left at the southern fissure, the lava flow emission has ceased and the flows are now cooling. Strombolian activity at the summit vent decreased as well back to mild levels with ejections rarely surpassing 50 m.
Fuego (Guatemala): Activity at the volcano is still elevated but slowly decreasing. The observatory reported 4 moderate and 13 weak explosions with ash plumes rising to 500-800 m height above the crater, glowing material thrown to 200 m above the crater. The lava flow on the upper southern slope decreased to 200 m length. The explosions were often accompanied by rumblings and moderate shock waves. Ashfall occurred in the villages Panimaché, Morelia, Sta. Sofía, Panimaché II, Ceilán, Rochela and San Andrés Osuna. San Miguel (El Salvador): No significant changes have occurred, but the authorities warn that another eruption in the near to medium-term future cannot be ruled out. Seismic activity with the presence of volcanic tremor remains at elevated, fluctuating levels. A degassing, SO2-rich plume rises about 150 meters above the crater. Nevado del Huila (Colombia): Following a nearby magnitude 4.5 earthquake at 06:07 local time on 9 Jan, a swarm of volcanic-tectonic quakes was detected at 12-16 km distance NE of the volcano and at approx 10 km depth. During the first day, more than 600 small quakes were recorded. The swarm decreased over the past days and no other (visual, deformation etc.) changes at the volcano were observed. Galeras (Colombia): The volcano emitted again small ash plumes yesterday. The rate of such small eruptions has apparently picked up. Pasto observatory last reported similar small ash emissions on 13, 26 and 31 December, and on 8 January. Nevado del Ruiz (Colombia): Over the past weeks, the volcano continued to have rather low seismic activity, mainly in the "usual" area S and SE of the Arenas crater at approx 8 km depth. At the surface, the volcano produces intense degassing with a plume sometimes reaching 1.5 km height. Sotará (Colombia): Seismic activity remains above background and is mainly associated to internal rock fracturing processes. During the first week of the new year, the number of earthquakes increased slightly, with a magnitude 3.7 quake at 12:22 local time on 5 Jan.